Our Heavy storage benchmark is proportionally more write-heavy than our heaviest in-house tests, but much shorter overall. The total writes in the Heavy test aren't enough to fill the drive, so performance never drops down to steady state. This test is far more representative of a power user's day to day usage, and is heavily influenced by the drive's peak performance. The Heavy workload test details can be found here. This test is run twice, once on a freshly erased drive and once after filling the drive with sequential writes. 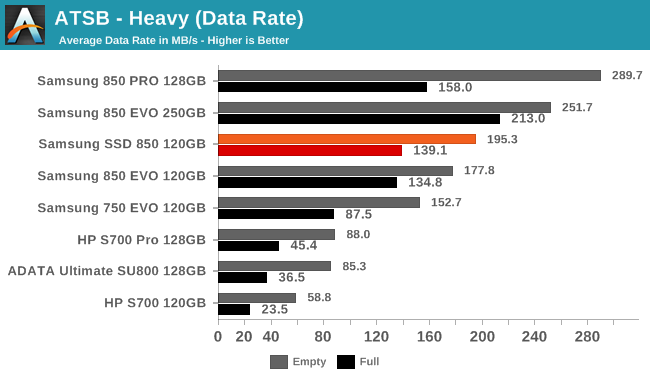 The average data rate of the Samsung SSD 850 120GB on the Heavy test is slightly faster than the discontinued 850 EVO 120GB, but nowhere near the performance of the 850 PRO 128GB. The drives using Silicon Motion controllers and Micron 3D TLC offer less than half the speed of the 850 120GB. 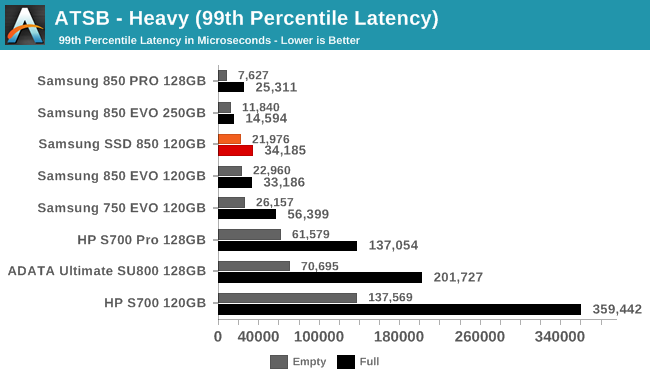 The average and 99th percentile latency scores of the 850 120GB are very similar to the discontinued 850 EVO 120GB, but slightly faster. 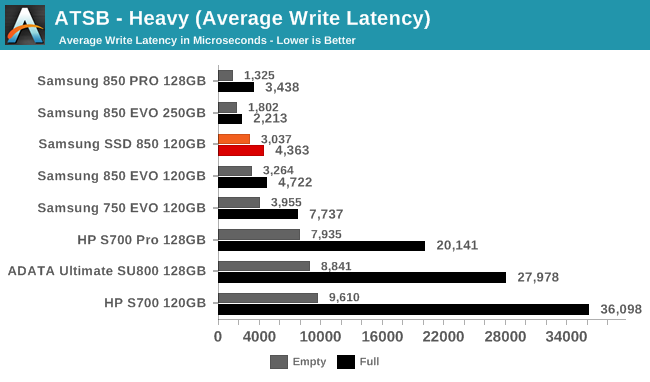 The 850 PRO 128GB and the larger 250GB 850 EVO are faster, and the 250GB EVO in particular shows less of a performance impact when the test is run on a full drive, but in all cases the Samsung drives offer lower latency than the Micron-based drives. 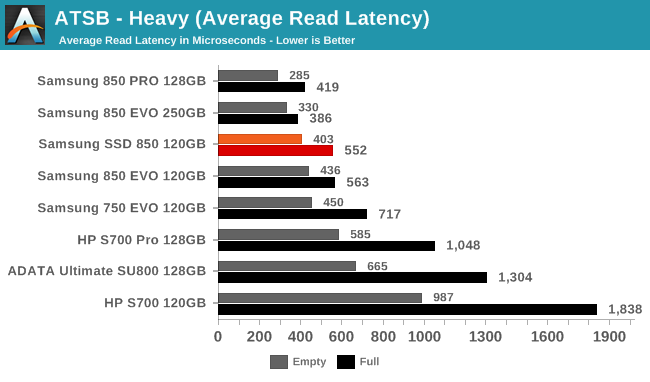 The average read and write latencies of the 850 120GB are slightly faster than the 850 EVO 120GB. The write latencies show more variation between drives than the read latencies, and the write latencies are much higher than the read latencies. 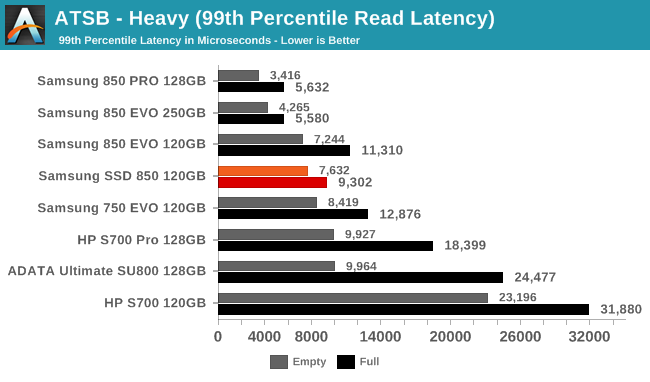 The 850 120GB has slightly worse 99th percentile read latency than the 850 EVO when the test is run on an empty drive, but better 99th percentile read latency when the drives are full. 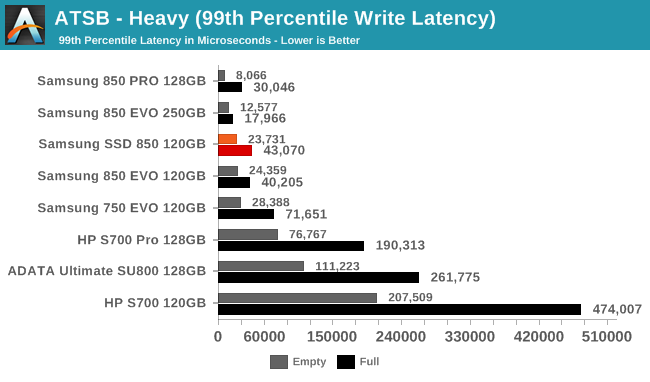 The situation is reversed for 99th percentile write latency, but both the SSD 850 and 850 EVO drives still have a lower latency than the 750 EVO.